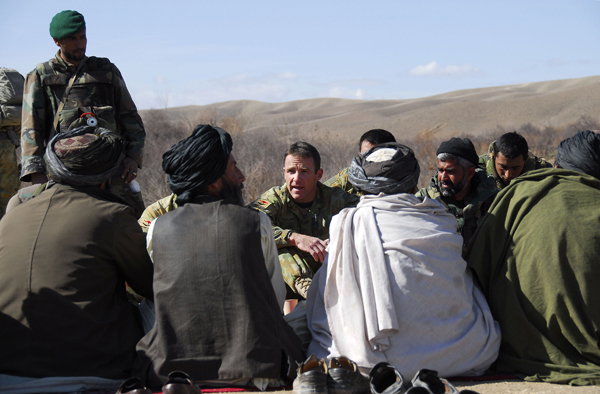 Two commandos of the Australian Special Operations Task Group (SOTG) were cleared in late May of manslaughter charges arising from the death of Afghan civilians in a botched raid on a local compound. The SOTG, comprised of special forces soldiers operating under US command, is deployed as part of Australia’s contribution to the NATO-led International Security Assistance Force (ISAF) in Afghanistan, and is involved in targeting commanders in insurgent networks. This incident reflects the tactical challenges that come with operating in a complex environment. In fact, it is the result of a lack of clear strategic aims in Afghanistan that are yet to be rigorously debated and communicated to the Australian public. As revealed in an Age article by Bette Dam and Tom Hyland, the commandos acted on false intelligence that an insurgent was living in the compound. After an exchange of gunfire and fragmentation grenades, an Afghan civilian man, Amrullah Khan, and five children were killed, and several others wounded. Amrullah Khan was later found not to match the description of the insurgent. Rather, he was falsely accused of insurgent activity by a family member as part of a blood feud, as Dam and Hyland explain, in which the commandos became unwittingly entangled. Such entanglements and exploitation of ISAF forces by Afghans in local blood feuds are not unknown. In another article published the same day, Dam explained that such practices are well documented; in fact, two separate reports, one by the United Nations and the other by the Afghan Analysts Network, found that there have been numerous instances of false intelligence having been provided to ISAF members, and, in many cases, these have led directly to the deaths of innocent civilians. Yet, serious questions must follow. As Amrullah’s wife, Shapiro, asks, why was the intelligence not independently verified by the commandos? With the practice of false intelligence widespread and noted between coalition partners, what procedures were in place to ensure this would not happen to SOTG members? If procedures were in place, how did they fail the commandos in question? What information sharing takes place between coalition partners? While there are ever-present challenges with human intelligence, there is one explanation as to how such an incident could occur. In a January 2010 report, Major General Michael Flynn, the top ISAF intelligence officer in Afghanistan, argued that there has been a serious disconnect between military intelligence and the overarching strategic aims of the conflict. He condemned poor coalition intelligence practices in Afghanistan that are driven by a lack of understanding of the strategic demands of the war. As a result there is a perceived disengagement of intelligence officers from aid workers and local Afghans best placed to provide human intelligence, and so intelligence product is at times ignorant of local power dynamics and social relations. With such narrow intelligence forming the operating picture, accidents such as the death of Afghan civilians occur and further undermine the strategic imperatives such as protecting the local population. Furthermore, local actors keen to exploit ISAF assets supplement this narrow picture with false leads. The inability to translate strategic objectives to tactical gains is hardly limited to the realm of military intelligence. Rather, it is reflective of the overall difficulty in extracting a clear strategy for continued engagement in Afghanistan. The muddied way in which our strategy in Afghanistan is handled in Australia’s public debate is the result of limited information about our role in the conflict reaching the public. The tight grip on information held by the Department of Defence is striking. The recent shooting of Australian soldier Lance Corporal Andrew Jones at the hands of an Afghan soldier, for instance, was reported by Reuters and a Kabul-based BBC journalist some 12 hours before an official Defence notification of an “operational incident” was released. While delays are caused by operational security and by the need to notify next of kin, questions must be asked about the efficiency of the Defence public relations machinery in effectively responding to a 21st Century of instantaneous news. For its part, the media has been curtailed in its ability to provide information about operations to the public. In July of last year, journalist Chris Masters imparted to an audience at the Lowy Institute the frustrations involved in trying to report on Australian Defence Force activity. The self-defeating nature of Defence’s restrictive information policies was demonstrated after the compound raid in question. The Department merely issued a statement in the wake of the incident stating that a “suspected insurgent” alongside five children had been killed and that an investigation would be launched. In contrast, Shapiro claims the Australian commandos immediately compared her husband to a photo of their intended target and realised their mistake, whilst their translator repeatedly shouted “it’s not him”. Perhaps a better course of action for Defence could have included clarifying the matter, issuing an appropriate apology and stating upfront that not only was it mistaken to think that Amrullah was an insurgent, but that such a belief was credibly constructed on false information. Defence needed to be honest about the nature of complex operations; in modern low-intensity conflict, there are a multitude of challenges, including linguistic, cultural, environmental and technological dimensions. Defence, and the Australian Government, did itself no favours by failing to take charge of the course of public perceptions of not only the commandos, but of Australia’s overall conduct in the war. Instead, an opportunity to help shape the narrative of the Afghan conflict was lost. In contrast, the media release related to the commando incident acknowledged the killing of five children but merely stated, “Defence is obviously concerned about any loss of life.” In both cases, the civilian deaths were accidental but Defence’s approach to handling the information operations side of the Afghanistan conflict leaves much to be desired. In any case, Defence’s lack of disclosure is the result of weak public demand for greater information. The lack of push from the media and the public, which provides no political incentives, allows current practices to continue. This dearth of information provided by Defence in the public domain in turn allows Australia’s political leaders to continue to maintain a parsimonious narrative regarding Australia’s strategic interests in Afghanistan. The parliamentary debate held in October last year saw broad agreement between the Government and the Opposition on the nature of our commitment there. This lack of disclosure, maintained under the guise of either operational security or legal restrictions, does not help to shape the Australian public’s perceptions of our engagement. In the case of the commandos, full disclosure about the complex operational environment would have enabled better understanding of their situation in combat. Both sides, the tactical and strategic, are required for a balanced understanding of this conflict. Indeed, when Defence can be seen to be making excuses rather than discussing the facts maturely, it is hardly surprising we have not seen a serious dialogue on the matter. This article and image first appeared in the Winter issue of AIIA Quarterly Access.